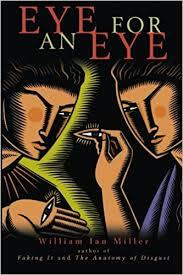 The Scholar's Stage: Vengeance As Justice: Passages I Highlighted in My Copy of "Eye for an Eye"
Great post. Philip Carl Salzman's "Pastoralism" and "Culture and Conflict in the Middle East" provide very clear analysis of how retaliation worked in the "segmented" societies of pastoralism. Basically, the various levels of lineage connection (individual, immediate family, extended family, lineage) balanced each other, depending which individuals the dispute was between. The famous Arab saying ("me against my brother, my brother and I against my cousin, my brother and cousin against the world") expresses this. In other words, the ancient Nordic, Greek and Biblical talionic societies, viewed through the lens of their own ancient "propaganda" left to us, are found honorable and virtuous. But the modern-day Middle-east and urban-ghettos talionic societies, viewed for what they are by (more-less) objective outsider, turn out to be rather nasty and dysfunctional. How come? Well, here's a thought: maybe this "model of the well-functioning talionic society one sees in the sagas, in other heroic literature, or in the ethnographic accounts", which Miller so admires, in reality never did exist, outside sagas, heroic literature and ethnographic accounts. Maybe those ancient eye-for-an-eye societies were just as dysfunctional and problematic as their present-day versions. And maybe that's the reason why civilization moved on from this early and, dare I say, rather cured model of existence. 1) Civilization did not move away from it in "early" days. Alexander Hamilton died in a duel for his honor only two centuries ago! 2) "Propaganda" is not the right term for Miller's sources. For one thing, many are intensely critical of the values they describe. Njal's Saga, the most famous of the sagas, is in many ways the greatest critique of honor ethics ever penned. The Iliad goes out of the way to devalue the honor system that drives the book forward (see books 9 and 6 especially); the Sermon on the Mount is an anti-vengeance polemic. Many of the sources used are about entirely different subjects and mention it only in passing (The Book of Job or are simple lists of facts or laws. Finally, the "ethnographic accounts" he talks about were written by "objective outsiders" in modern days who lived among latter-day honor cultures for a season. 1) That's hardly the point. The fact honor killings happen and happened as early as 200 years ago doesn't mean that there are not better systems of justice around. There are and there were, and Hamilton indeed was an architect of one. 2) I know that propaganda isn't the right term, that's why I put it into the brackets. The point is - and this ties into 1) - neither the compilers nor the characters of those early sources had an alternative to their system of talionic justice. It was all they knew. Hence their bias. Thus, they could describe both the bad and good sides of honor system (the ending of Iliad, for instance), but they couldn't question or value the system as a whole, because they saw no alternative to it but chaos. It's only when new, different systems of justice started to take hold in civilization - in West in say, roughly around 600-500 BC - that you get first criticism of talionic justice, as a system, from the outside. Aeschylus Orestia, for instance, makes a case that system of honor killings, rather than being the only alternative to societal chaos, is in fact what creates societal chaos, especially when compared to the system of abstract and rational laws which Athena praises and embodies at the conclusion of The Eumenides. The same can be said of Hebrew prophets, who arose around the same time to criticize various tribial and talionic aspects of Mosaic law, emphasizing rather national unity of Israel and an overreaching justice of God. Now, far from me to say that an outsider's perspective is the only right one, but neither is the insider's one, and you need both to make a valid conclusion, and you need to be as careful and objective as possible in evaluating both of them. And what Miller seems to be doing, according to your account, is mixing apples and oranges, i.e., comparing modern day honor systems, based on outside accounts of them, with the ancient ones, based on their own inside accounts. Thus one ends up looking bad and dysfunctional, and the other ends up looking as the only possible one. That's a serious flaw in his logic IMHO. Your point makes more sense now. However, I don't think all the evidence quite lines up with it. The research of William Irons, Phillip Salzman (wrote about one of his books here: http://scholars-stage.blogspot.hk/2013/11/the-nomadic-survival-strategy-salzmans.html ), and a few others who have focused in on pastoral nomads show that it is quite common for people to choose stateless nomadism--where disputes are resolved exactly along the lines sketched by Miller here--when other options were available to them. There is this notion that nomadism is mostly a response to ecological factors. They demonstrate quite conclusively that this is not the case. Many nomads choose nomadism precisely because they find the sort of justice provided by (relatively) "modern" states to be onerous. This isn't a new development. All the way back in Sima Qian's day Chinese leaders worried about their people running away to go live in the pell-mell world of the steppe. And as Spandrell's quote upstream (an excerpt from a med. Chinese history) documents, eye-for-an-eye was the explicit rule for most folks north of the long walls. The choice has been offered... and in many. Political philosophers have doubted the compatibility of various major values, such as equality and freedom. Ethnographic and historical evidence has indicated the presence of (1) economic equality and individual freedom in the absence of civil peace in segmentary societies based on self-help; (2) economic equality and civil peace in the absence of individual freedom in corporate societies; and (3) individual freedom and civil peace in the absence of economic equality in mercantile and capitalist societies. However, little if any evidence has documented all three -- economic equality, individual freedom, civil peace -- in stable coexistence. By way of delineating the relations between and among the values in question, I offer "The Iron Law of Politics," which asserts that economic equality, individual freedom, and civil peace cannot all exist simultaneously in any society, although any two of the three can.